You’re going to love Bids for Bargains! What area are you looking for? Click Here for items in Mt. Pleasant/Sulphur Springs and surrounding areas! 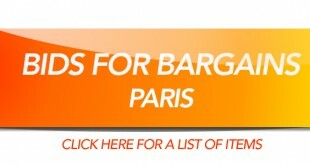 Click Here for items in Paris and the surrounding areas! The Oxford English Dictionary lists the first use of the acronym OMG meaning “oh my god” as having appeared in a 1917 letter written by Winston Churchhill. This is Fact. Tiny invertebrates called water bears can survive in outer space. Fact! They are the first animals known to be able to survive the harsh combination of low pressure and intense radiation found in space. Wayland J Oliver, 75, of Paris, passed away Jan. 11, 2018, at his home. Services are scheduled for 2:00 pm Monday, Jan. 15, at Bright-Holland Funeral Home with burial following in Long Cemetery. The family will receive friends at the funeral home one hour prior to the service.